From sherwanis and kurtas to Jodhpur pants and jackets, get a style that fits you at Manyavar. Not that you could ignore it with Virat Kohli telling you all the time how awesome the merch is! Their range of sherwanis will leave you scratching your head for sure — it just doesn’t end. Colours, designs, or type, you can almost build your custom sherwani here. You can pair up an ivory kurta with a double-layered short jacket, or a satin lapel tuxedo over an ivory kurta and sherwanis with embroidery. Get these resplendent sherwanis in silk jacquard for INR 12,000 or INR 15,000. For a casual daytime look, pair a bright silk kurta with a short jacket on top for INR 6,999 onwards. For evenings, this cream and gold sherwani with tone-on-tone embroidery works well. 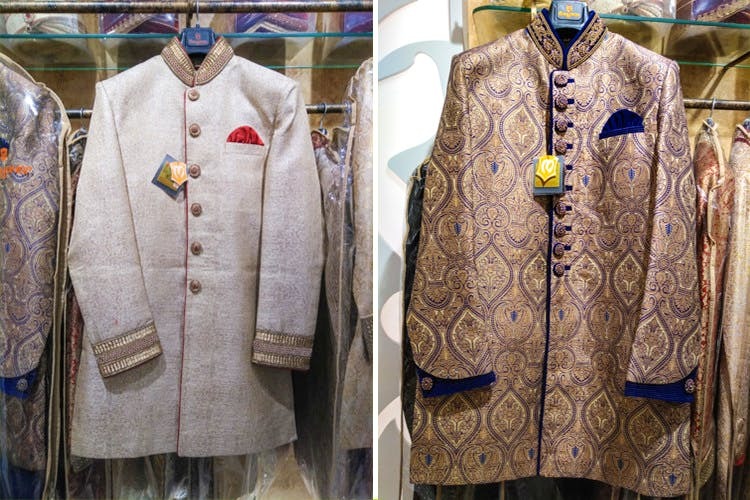 Manyavar has a huge range of looks — from sherwanis to dhoti kurta looks and Indo-Western wear, they have everything. The collections include exquisite sherwanis, Indo Westerns, royal bandhgalas, jackets, kurtas and matching accessories which can all be customized to suit your needs. This one-stop store for grooms and men of the family for functions big and small has multiple outlets in the city — from Gariahat to Shakespeare Sarani. Pick one closest to you. For the reception, break the slew of appearances in traditional Indian wear and go offbeat with a Jodhpuri suit instead. Add an individualistic pocket square and cufflinks to you shirt. The black Jodhpuri suit is for INR 12,999 and the second one with the cream pants is for INR 14,999.